How do I charge away from home? We need more fast charging capability and fast charging infrastructure. While DC fast charging is leading the way, it’s possible to build AC fast charging systems using 3 phase AC. Some automakers do so already, primarily in Europe where 3 phase AC is more prevalent. The leading example, the Renault ZOE, supports 43 kiloWatt AC fast charge while being a small inexpensive electric car. 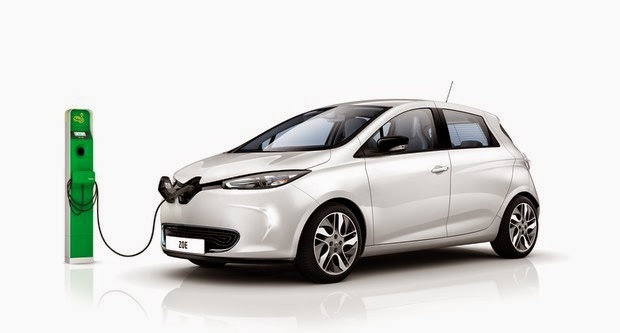 The Renault ZOE comes with a flexible charging system that can work with any charge rate from 3kw (normal power outlets) to a 43 kilowatt three phase AC fast charge. What’s important about this is that the charging is implemented entirely by on-board equipment. The Renault Chameleon charging unit does not require an off-board charging unit. By contrast, DC Fast Charging systems use a DC interface to the car and the AC-DC rectifier is located in the fast charging station. The Chameleon charging unit supports single-phase AC (up to 3 kiloWatts) and three-phase AC at rates up to 43 kilowatts. At the Renault ZOE (93 mile range, presumably a 20-25 kilowatt-hour pack) can fully recharge in 30 minutes or so. They did a long distance 24 hour endurance event with a pair of ZOE’s, one of which drove a bit over 1000 miles using fast charges the whole time (18 fast charges in total). 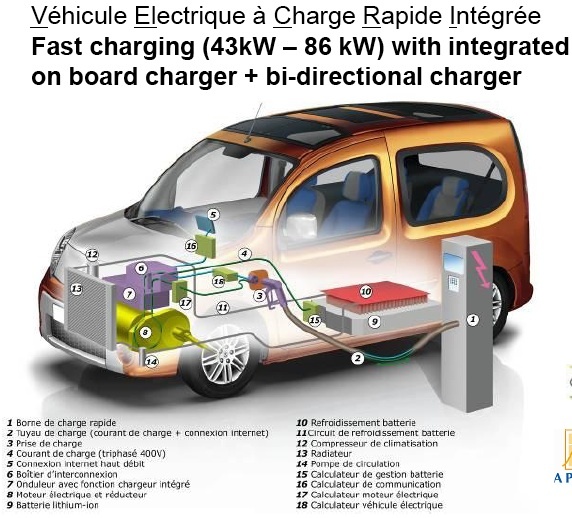 When originally announced the ZOE was to use a quick battery exchange system (presumably Better Place, because Renault had already partnered with Better Place). When shown at the 2012 Paris Auto Show the battery swap system (which Renault calls “quickdrop”) was nowhere to be seen. Instead Renault embraced fast charging instead of battery swapping. What kind of terminal is required? A specific high-power terminal (400 V – 63A). How long does it take? 10 minutes is all you need for an additional range of 30 miles. When can the system be used? The system can be employed when in the city, before a meeting, during your lunch break, or even while travelling Ð whenever your battery needs a little extra power. Where can the terminals be found? Recharging terminals will be installed near residential developments, offices and businesses, so that they are always close to hand. Quick recharging: establishing connections across Europe. To get the most out of your electric motoring, around 20 automotive manufacturers are currently working to standardise a high-power socket at European level. Developed in conjunction with the German RWE group, the project will ensure common recharging infrastructures, despite differences between network capacities and electric vehicles. Presented in Hannover last April, it will be suitable for recharging all future Renault Z.E. vehicles. The world’s first mass market electric vehicle with a tax-paid price tag (in France) starting from Û13,700. The world’s first mass market electric vehicle with an NEDC-cycle homologated range of 210km. The first vehicle to be equipped as standard with “Range OptimiZEr”, a system designed to optimise real-world range under all driving conditions. In built-up areas, for example, customers can expect a real-world range of between 100km and 150km depending on their driving style and the prevailing weather conditions. Thanks to its Chameleon battery charger, ZOE is the first electric vehicle that can be fully charged in between 30 minutes and nine hours depending on the power available at the charging station (between 3kW and 43kW), using a single type of connector for the car. The first electric vehicle to enable the massive roll-out of fast charging stations which are easier to use and up to four times more economical for local authorities. The first Renault vehicle to be equipped as standard with Renault R-Link, an integrated, connected multimedia tablet. The Chameleon battery charger revolutionises the way electric vehicles are charged. ZOE is the only vehicle to be equipped with the Renault-patented Chameleon charger which is compatible with all electricity supplies up to 43kW. It enables batteries to be charged in a period of between 30 minutes and nine hours. For example, when connected to an electricity supply of 22kW, ZOE’s battery charges in one hour. This intermediate power level favours prolonged battery life and has less impact on the electricity network than a fast charge at 43kW. The Chameleon charger enables fast charges at charging stations which cost a quarter of the current price. Today’s fast charging stations are equipped with a high-power charger. However, in the case of the Chameleon charger, which is built into the vehicle itself, there is no longer any need for the station to be equipped with its own charger. It will consequently be possible to introduce new, simpler and cheaper fast-charge stations which cost less than Û3,000, a quarter of the current price for fast-charge stations. ZOE has set a new world record for the longest distance travelled in 24 hours by a production electric car. ZOE completed 363 laps of the Aubevoye speed ring in Normandy, a distance of 1,618 km. It thereby betters the former record of 1,280 km by 25%. ZOE improves the former 24-hour distance record for a production electric car by 25%. ZOE has clearly demonstrated its performance and reliability, highlighting the significance of its best-in-class range and revolutionary Chameleon charger. ZOE can be reserved from today on renault-ze.com, with VIP content available to the first customers. Two Renault ZOE vehicles set out on the speed ring at the Aubevoye technical centre (CTA) in Normandy. Fifteen drivers from Aubevoye, ClŽon, Sandouville, Flins, Douai and Grand Couronne take turns at the wheel, driving and charging as necessary. Twenty-four hours later, the two ZOE vehicles cross the finishing line, with mileage of 1,618 km and 1,506 km respectively. Both models have fulfilled their promise with a demonstration of performance and endurance. For this performance, ZOE was able to take advantage of a major technological breakthrough: the Chameleon charger. This original world-first system makes ZOE compatible with any socket and any power level. ZOE was therefore able to be fast-charged at 43 kW, regaining 80% of battery capacity in under thirty minutes. This challenge was also made possible by the best-in-class NEDC range of 210 km (between 100 and 150 km in real conditions, depending on conditions of use). Overall, the finalist ZOE was fast-charged 18 times in 24 hours. Renault Z.E. Ecosystem – for CSDM2011 which appears to have been a trade show held in 2011. Shows “quickdrop stations” (fast battery exchange) being available for the Renault ZOE. Shows an “AC Quick Charge” rate from 3kw to 43kw through a Type 2 plug (see above). This image comes from page 27 of the slide deck and shows the schematic. It suggests an acronym VELCRI and a 43-86 kilowatt charge rate, with bi-directional power exchange. Page 28 shows an inductive charger. Page 35 shows a diagram of charging stations with local energy storage to mitigate load on the grid. In the U.S. (maybe elsewhere) the key issue is demand charges, and by having local energy storage demand charges are avoided. The European version of the Smart ED supports 3-phase AC fast charging at 22 kiloWatts charging rate. This feature is not present in the American version.